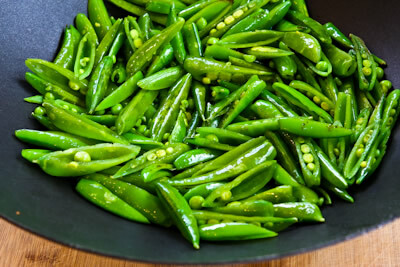 Snap peas - Pisum sativum var. macrocarpon | Sugarsnap Peas - are a cultivar group of edible-podded peas that differ from snow peas in that their pods are round instead of flat. The name mangetout (French for "eat all") can apply both to snap peas and peas. Peas, like all other peas are pod fruits. An edible-podded pea is similar to a garden or English pea, but the pod is less fibrous, and edible when young. 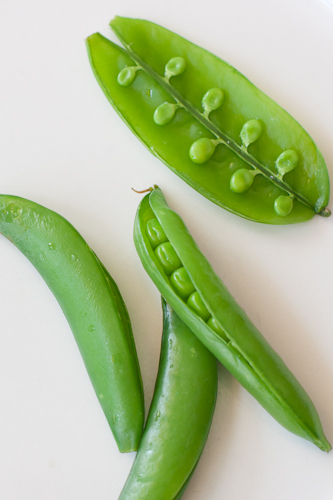 Edible-podded pea pods, including peas, have a membrane and do not open when ripe. At maturity, the pods grow to about 4-8 cm long, pods contain three to five peas per pod. Often served in salads or eaten whole. They can also be fried or steamed. 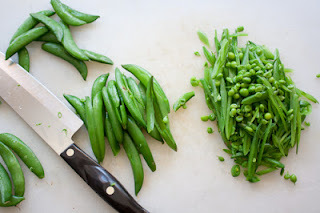 Before being eaten, mature snap peas pods may need to be "string", which means the membranous string running along the top of the pod from base to tip is removed. Over-cooking the pods will make them come apart.